"Alisha A. Wood is a fabulous lawyer. She was very informative to me about everything and definitely helped me get a much lesser and better deal with the court. I WOULD STRONGLY ENCOURAGE ANYONE LOOKING FOR A GREAT LAWYER TO CONTACT ALISHA A. WOOD." California DUI cases are rarely hopeless. Police officers bungle roadside investigations. Breathalyzers and blood testing are prone to error. Medical conditions render falsely high BAC readings. Good DUI defense lawyers capitalize on these issues to win cases. 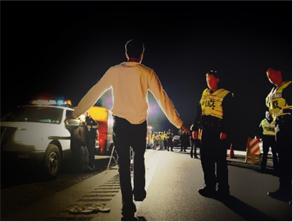 Most people arrested for a California DUI charge assume the evidence against them is insurmountable. Most of them are wrong. At the conclusion of the hearing, the DMV’s hearing officer takes the matter into consideration and later issues written findings. The decision usually gets mailed out in one to 30 days. If the DMV finds in your favor, no license suspension is imposed (though a DUI conviction in court could trigger a separate suspension). If the DMV finds against you, your license goes into suspension within a few days of receiving notice. Note: DMV hearings only occur for DUI of alcohol arrests (to determine if you drove with a .08 or higher BAC, or any positive BAC level in the case of an underage DUI). If you got arrested for a California DUI of drugs charge–including DUI of marijuana, DUI of Vicodin or DUI of Ambien–there is no DMV hearing. But if you get convicted of any of these charges in court, the court conviction will trigger a drivers license suspension. If you do sustain a drivers license suspension, you can usually get a restricted license within 30 days. This allows you to drive to and from work related activities and any court or DMV imposed alcohol program. Sometimes we can make arrangements to get you a restricted license right away. But you must heed the suspension while it’s in effect. Driving with a suspended license in California is a crime and can lead to jail time, a probation violation and a longer license suspension.